Non-Hazardous alternative to methylene chloride and other pu foam remover methods. The unique formula is suitable for use on mild steel as it will not tarnish the metal but will effectively remove cured polyurethane. Non-hazardous polyurethane remover for use on easily corroded metals. Manufacturers who use polyurethane across the globe understand the importance of being able to remove excess polyurethane that has cured. This can restrict the operation of equipment and substantially reduce its operational life. While there are many polyurethane removers on the market many of them require great caution. 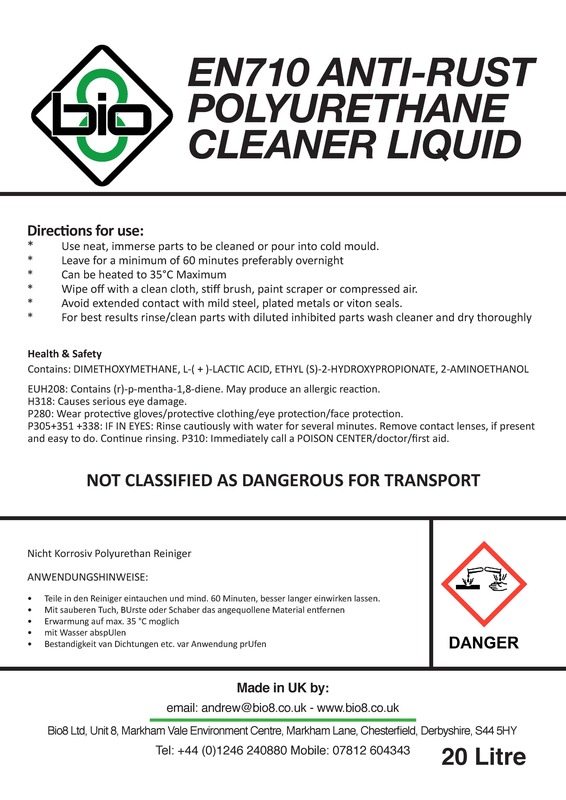 Traditional solvent based cleaners such as Dichloromethane are highly corrosive and can not be used to clean Iron, low grade stainless steel, copper, aluminium, titanium and most alloys. 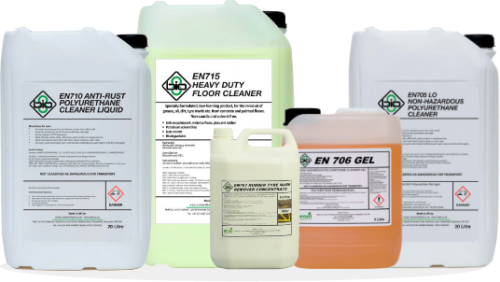 Machinery with components that are susceptible to corrosion should only be cleaned with a specialist PU foam remover such as EN710 anti-rust polyurethane remover liquid. 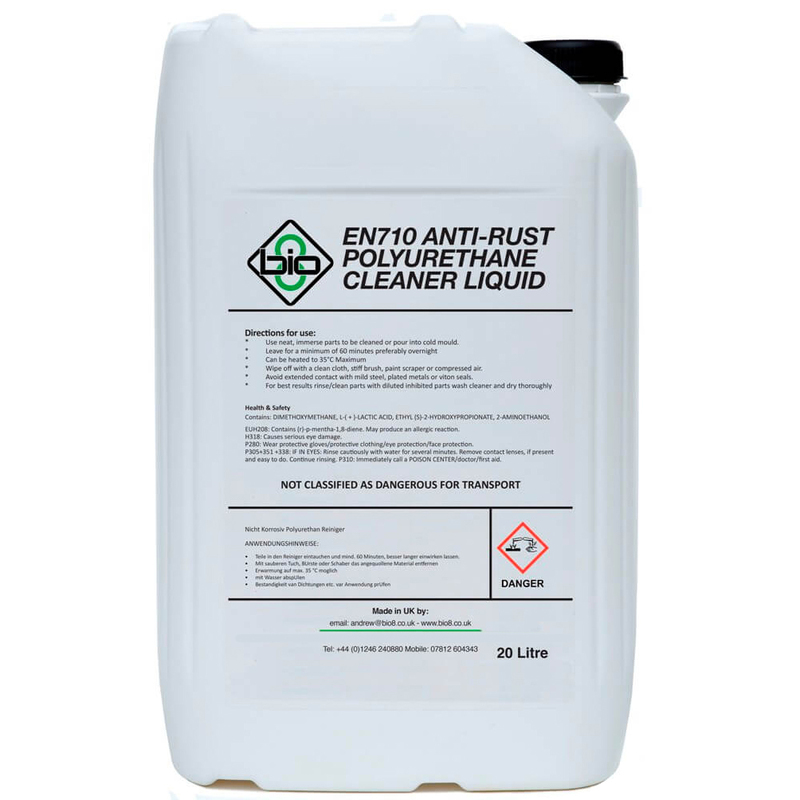 EN710 anti-rust PU foam remover is a formula to be absorbed by cured polyurethane. It acts to soften the residue by breaking down its structure, allowing easy removal. Designed to be effective on PU but not tarnish corrosion susceptible metals like Iron and aluminium and titanium. EN710 is not only safe for equipment. It is also offers very low health & safety and environmental hazards. This reduces the risks for storing, using and even disposing of the product. 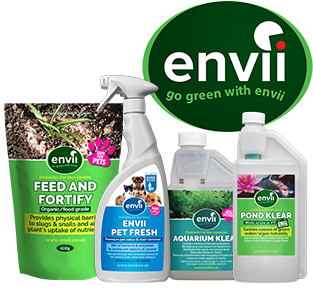 After cleaning fish out any large bits/residues of PU as this will extend the life and reduce cost in use for the product. Will this work on Stainless Steel and aluminium? What is the difference between EN705 and EN710? EN705 is stronger but is acidic and therefore only suitable for Stainless Steel or Aluminium parts. EN710 contains a corrosion inhibitor to help protect against rusting on mild steel. Can these products be used ina heated ultrasonic batch? Yes they can, however, the maximum temperature recommended is 35°C otherwise one of the key active ingredients starts to evaporate. 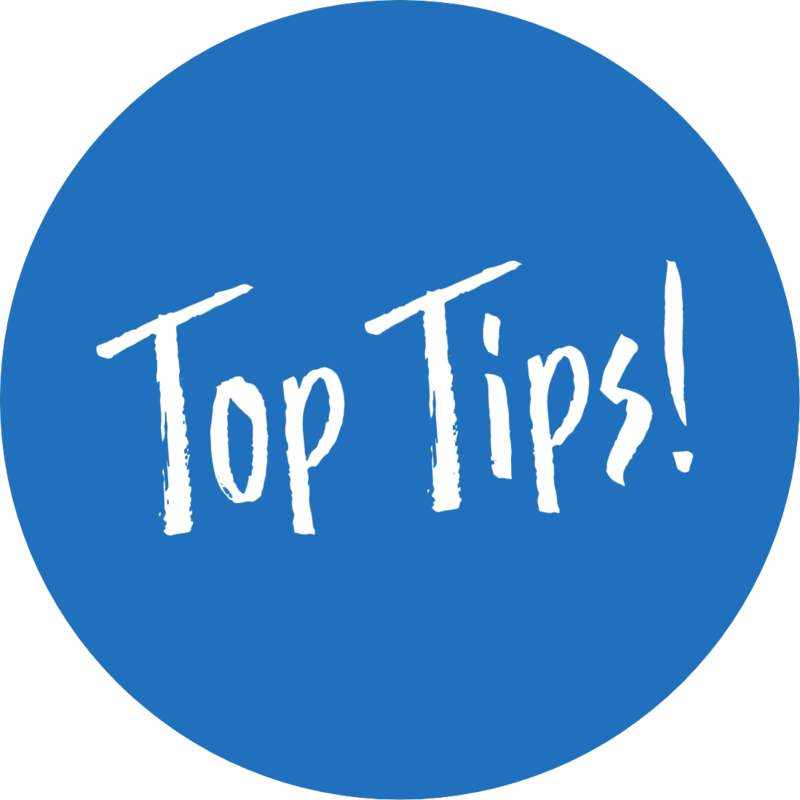 Therefore we recommend using a lit on heated baths so the ingredient can condense back into the solution.